The charming Key West Bed and Breakfast, also known as The Grand Guest House, is a guest house with all of the amenities of a Key West Hotel, the comfort of all of the Key West Bed and Breakfast's in town with the personal touch of a private guest house. The Grand Guesthouse, a member of the Key West Innkeeper's Association and the Key West Chamber of Commerce is also a recipient of the Superior Small Lodgings designation. Frommer's Travel Guide calls The Grand "undoubtedly the best bargain in town." (Frommer's South Florida 1999-2008). Find out why the Grand Guest House is everyone's favorite place to stay in Key West, FL. Off season rates start at $98, Shoulder Season rates start at $108, and High Season rates start at $168. Winner of the Superior Small Lodgings White Glove Award, all of our exceptionally clean rooms feature a queen bed, private bath, private entrance, cable TV with premium channels, air conditioning, telephone, ceiling fan, small refrigerators and some have kitchenettes. Children 12 years of age and over are always welcome. We do not accept pets. An expanded continental breakfast is included. Complete concierge service available. All rooms are non-smoking. The Grand Guesthouse is located in the heart of Old Town Key West, just five blocks from Duval Street, and five short blocks to the Atlantic Ocean. ocated in an area of Old Town Key West where cigar making was the primary source of income at the turn of the century, The Grand was a rooming house for the workers at the former cigar manufacturer at the end of the block. Built in the 1880s, the house was converted in the 1940s into the home of a single family. Occupied by the family until the 1960s, the structure was converted back to a rooming house in the ensuing years. Key West guesthouseIn 1998, the property was transformed from its formerly humble beginnings into The Grand Guest House. 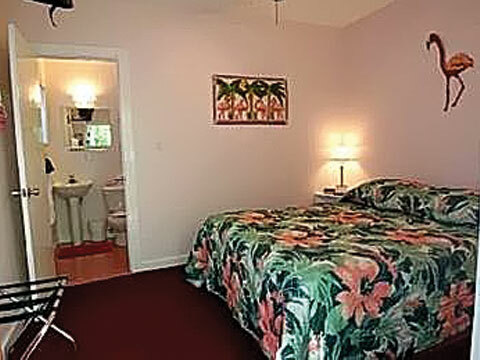 Today each room has a private bath, color cable TV, AC, phone, small refrigerator, ceiling fan, and tropical dÃ©cor. Lush tropical landscaping defines the outdoor areas, where deck chairs and a small table are found outside of every room. Our specialty is our knowledge of everything local. We provide local maps and steer you to all Key West has to offer. From restaurants to snorkeling to shopping and special events, weâ€™ve â€œbeen there and done thatâ€ so there are no surprises, just the best. Read our â€œGuest Commentsâ€ section, where our customers embarrass us with their kind words.